Rare trianguation chart of Southern Florida and the Keys. Sketch F Showing the Progress of the Survey in Section No. 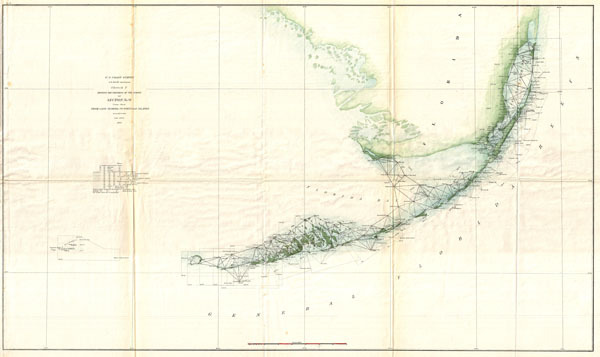 VI (Lower Sheet) From Cape Florida to Tortugas Islands from 1845 to 1859. A very attractive example of the 1859 U.S. Coast Survey triangulation chart or map of southern Florida and the Florida Keys. Covers from Key Biscayne Bay south along the Keys, past Key West, as far as the Marquesas Keys. Countless triangulation points are noted throughout. Names each of the Keys and identifies Miami at the northern edge of Key Biscayne Bay, and the city of Key West, at the time a prosperous center of commerce. The chart was produced in 1859 under the supervision of A. D. Bache, one of the most influential and prolific Superintendents of the U.S. Coast Survey. Report of the Superintendent of the United States Coast Survey, (Washington D.C.) 1859. Very good. Minor toning and wear and verso reinforcement on original fold lines. Printed on thin fragile paper. Else clean.